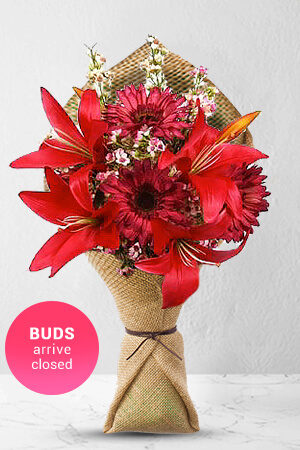 Show someone you care with this cute Ruby posy. 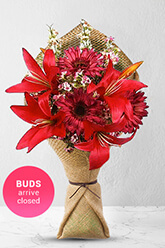 The beautiful, rich red Asiatic Lilies and colour coordinated red Gerberas will look dazzling in any room.Lilies may be sent closed/partially closed in order to prevent damage and to last longer.Ruby does not come with a vase however; if you would like to leave a lasting impression we recommend a Standard Vase to perfectly complement your flowers. You reminded me of my sister's birthday - although I had remembered it also. And I've received advice that the flowers were delivered to her today. Thank you.